Moving down from the skull and the muscles of the face, the neck seems like a good area to cover for a human anatomy for artists topic. You may be surprised at how many muscles are in the neck, but this makes sense. The neck can move in complex ways and that requires many structures working together. 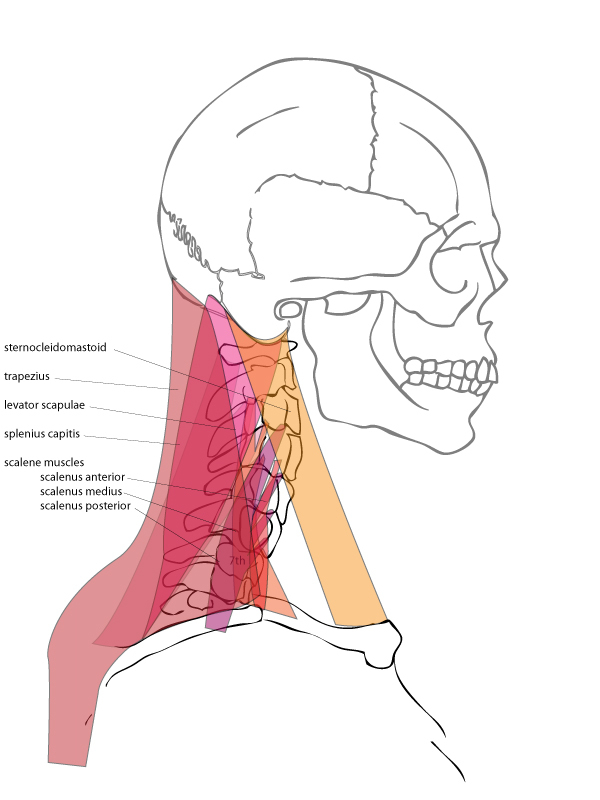 Today, we will look at the skeletal structures and some of the major muscles of the neck. 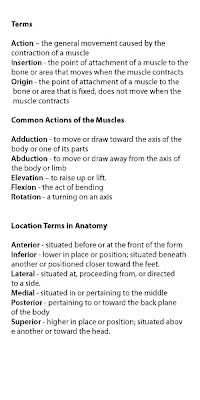 As with the post on the muscles of the face we will review the origin, insertion, and action of each muscle. Lets start with the skeleton. The the upper part of the spine is the skeletal structure of the neck. The job of the spine is to carry the head and to twist or turn to move the head. The spine consists of small sections of bone stacked on top of each other, these segments are called vertebrae. 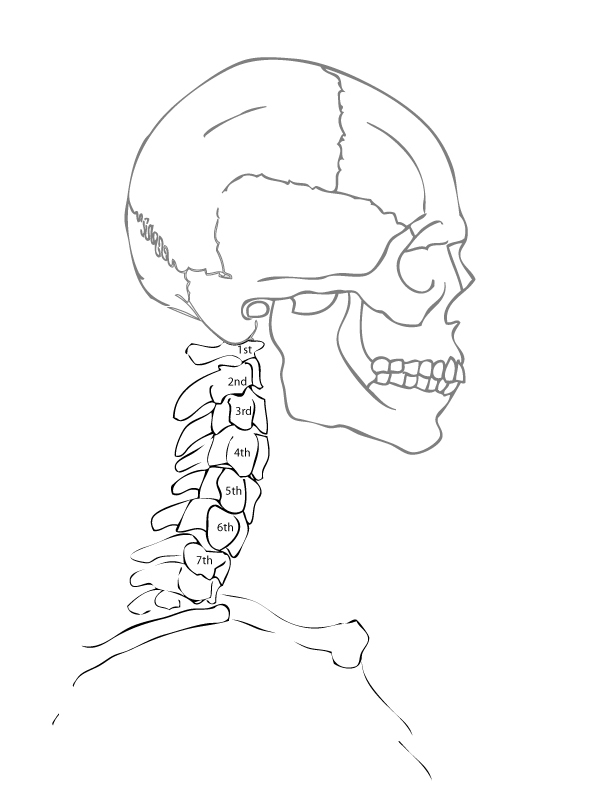 There are seven vertebrae that form the spine in the area off the neck. These seven vertebrae are called the cervical vertebrae and are usually numbered C1 through C7 from the base of the skull down towards the ribcage. We will use these terms and numbering for the different segments of the spine that are the origin or insertion of the muscles . 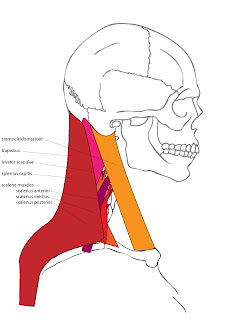 We are looking at the muscles of the neck that connect to the base of the skull and play a major role the shape of the neck and in moving the head. This will include the sternocleidomastoid, trapezius, levator scuplae, splenius capitus, and scalene muscles. Independently each muscle performs a task or an action. The action is how the body moves when the muscle is contracted or relaxed. For the most part, these muscles work together to move the head up, down, back, forward, left, and right. To the right is a image of the muscles we will cover today. 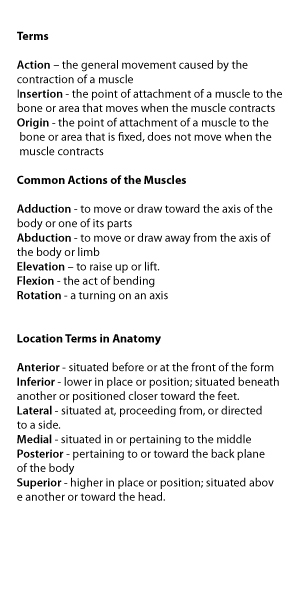 I have highlighted each muscle on this diagram and discuss some of the key elements of each below. The sternocleidomastoid muscles are the two long ropes of muscle that run from the skull behind the ear to the front of the neck. 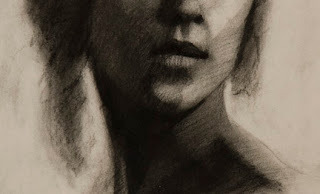 When drawing the neck, these muscles are visible features of the front and side of the neck. The two ropes descend down from behind the jaw down to the pit of the neck (formed by the top of the sternum and clavicals) forming a v shape. 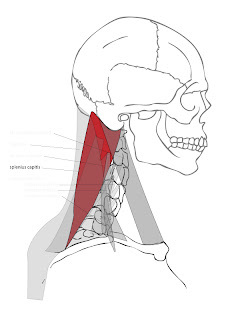 The trapezius is a muscle that starts at the base of the skull descends down the neck and spans across the back. 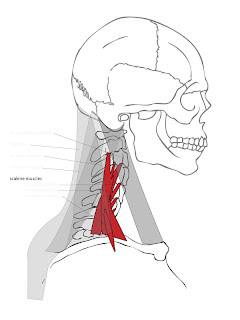 This muscle is really involved in the movement of the shoulders and back but it is important to include here because it is a strong visual component of the neck. The part of the trapezius that spans the neck starts as two rope like structures at the base of the skull and quickly fan out as the muscle reach the shoulders. 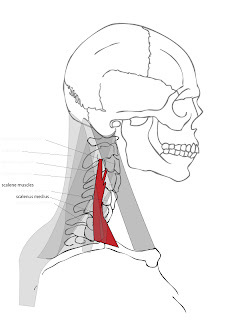 It is a large surface muscle that covers other neck muscles. The levator scapulae is a bundle of muscles that are attached to the upper cervical vertebrae and a portion of the scapulae. Most of this muscle group lies hidden underneath the trapezius. 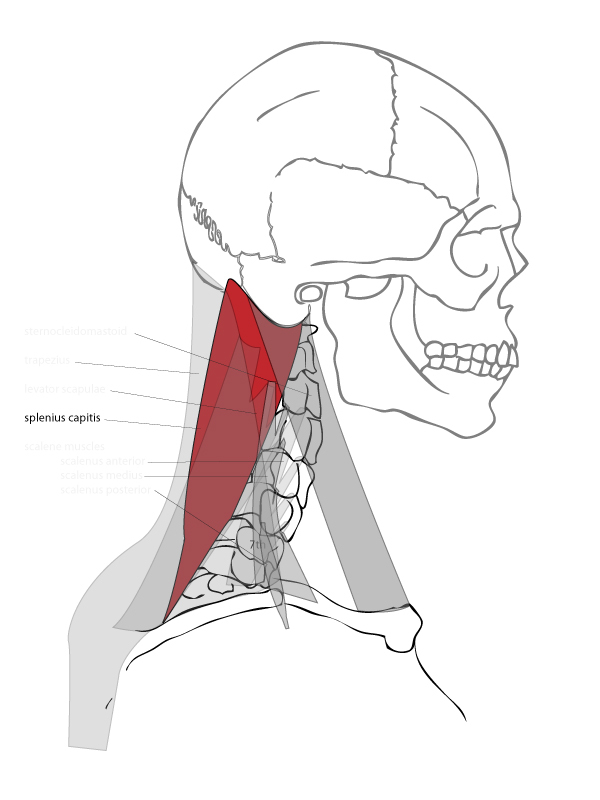 When contracted this muscle can either raise the scapula or pull the neck to the side. The splenius capitis is another muscle where much of it lay hidden underneath the trapezius. 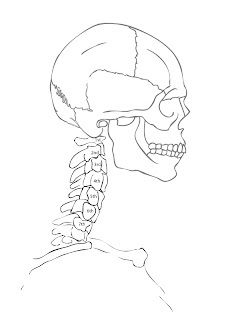 However, we can see the shape of the muscle in the neck near the base of the skull right behind the ears. It is the v shape moving from the mastoid process down underneath the trapezius. 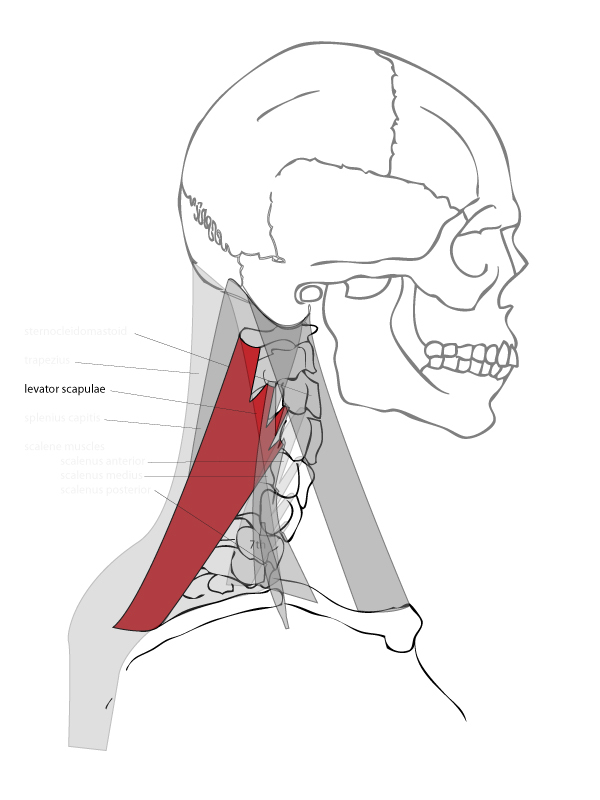 Not only does this muscle play a role in the visual form of the neck it also plays a large role in moving the head and flexing the neck. The scalene muscles are a group of muscles that are on each side of the neck. These muscles are used for flexing and titling the neck. They are not large muscles and buried deep within the neck, hidden underneath the larger muscles. 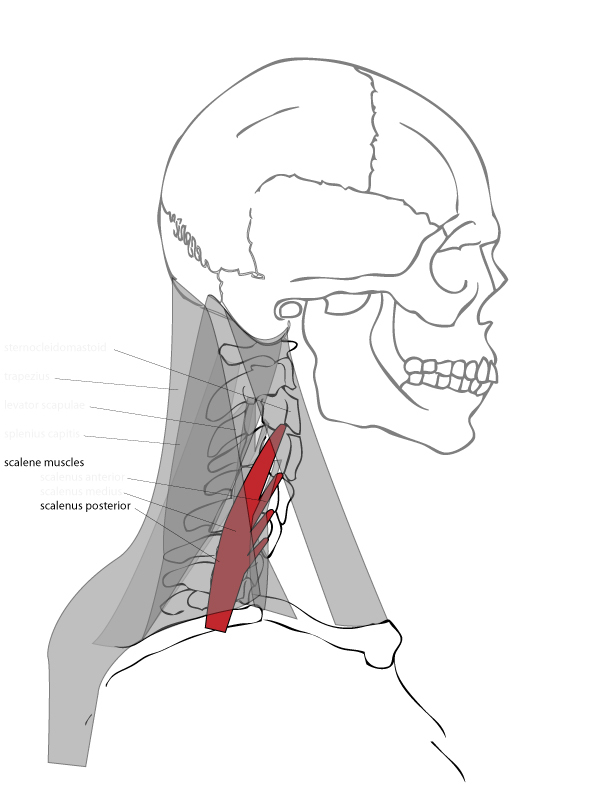 The scalene muscle groups are made up of three distinct muscles, the scalenus anterior, scalenus medius, and scalenus posterior. Of the three, the scalenus medius is the largest of the group and the scalenus anterior is the smallest. 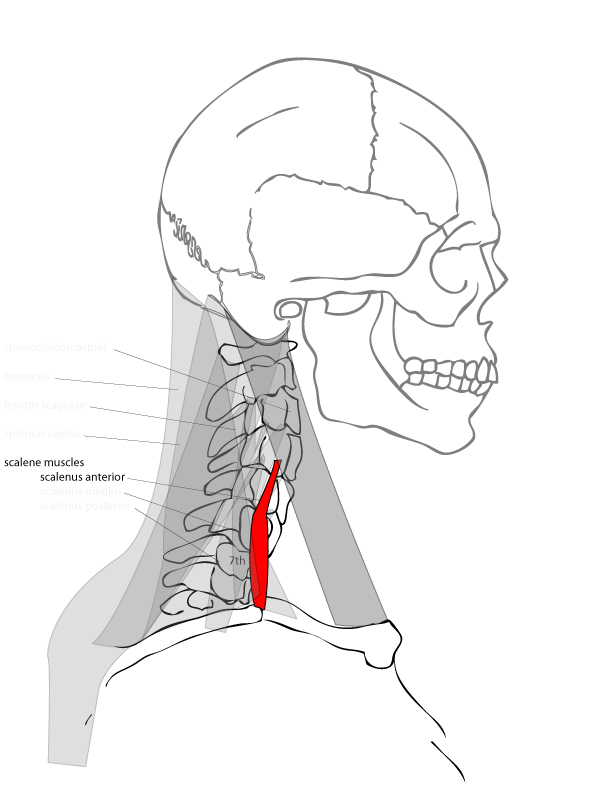 The scalenus anterior is a small muscle attached to the spine and the first rib. It is not a visible muscle under the skin. We just need to know that it helps rotate the neck. 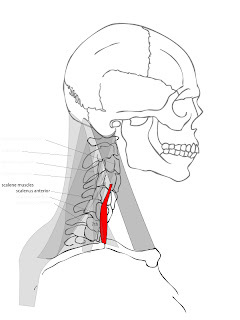 The scalenus medius also starts at the spine and connects to the first rib, though a little closer to the spine on the rib than the scalenus anterior. This muscle is also not visible and rotates the neck. 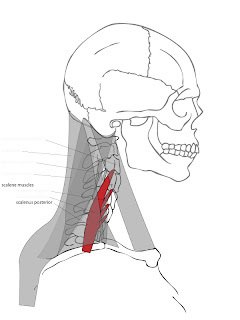 The scalenus posterior also starts on the spine but connects to the second rib instead. This muscle is also not visible and rotates the neck. There are more neck muscles to cover, but this is a good start. 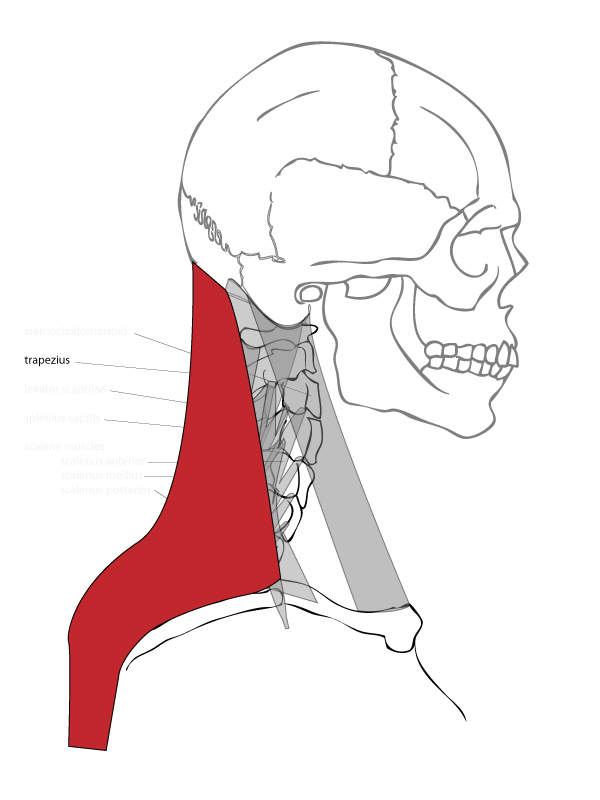 We can look for the shapes of the sternocleidomastoid, trapezius, and splenius capitus to help guide the shape of the neck. We can use the information of how each muscle moves the neck and head when contracted to accurately express movement and gesture. 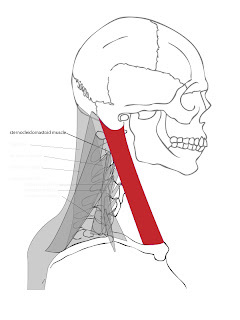 I was so thrilled when I first figured out about the sternocleidomastoid! It makes the necks in my drawings look so much realer, more expressive, and more exciting! Bravo! another great post. you illustrate clearly what I have been lectured on for the last 10 years of painting.